Angola , Mozambique , Malawi, Nigeria , South Africa , South Sudan , Zambia , Zimbabwe, Congo, Swaziland, Namibia, Tanzania, Botswana and many more. We praise God for the completed Die Weerklank van Martin Luther Afrikaans book just received back from the printer. We have a series of other book projects in the pipeline awaiting funds for printing. This includes The Greatest Century of Reformation (revised, expanded and updated), A Christian History of Africa (which is needed for my next series of history lectures at Back to the Bible Mission where over 100 students from 20 countries throughout Africa receive an excellent 3 year preparation for ministry). It is my desire to take this new updated Christian History of Africa book to provide a copy for every student. We also have a new Livingstone Fellowship Hymnbook, which includes great Reformation hymns through the ages, including: A Mighty Fortress is Our God in English, German, Afrikaans and French. We hope to have Lies We Have Believed ready and available for participants at our next Biblical Worldview Summit in January 2018. A completely new and expanded Security and Survival Manual is being produced for churches and missions. Dedicated Discipleship, War Against God and reprints of The Power of Prayer Handbook, Answering Skeptics and other vital books which we are now out of print, are all awaiting funds for us to go ahead and print. Our missionaries have submitted these requests for prayer and support for strategic mission projects: Boxes with Love for destitute pensioners in Zimbabwe. Since 1982, Frontline Fellowship has been ministering in Zimbabwe and delivering Love Boxes containing approximately 40 items, including basic high protein food, lotions, medicines and hygiene items for elderly Christians suffering in Marxist Zimbabwe. Each box costs approximately US$25 each. Bibles in Portuguese, Shangaan, Chichewa and Shona. Bibles in vernacular languages are rare, sought after and expensive. Each Bible costs approximately US$9. For Evangelists ministering amongst illiterate people, Mega Voice audio Bibles are ideal. These hand-held MP3 audios contain the entire Bible in different languages and do not need electricity or batteries, but are solar powered. Each Mega Voice costs US$32. There are trusted and trained Evangelists who we would like to equip with a Jesus Film kit. The films, DVD player, video projector, screen, solar panels, rechargeable batteries, etc. cost approximately US$1,200 per kit. We have shown the Jesus film to hundreds-of-thousands of people in approximately 100 languages throughout Africa and trained and equipped dozens of local Evangelists to continue using this tool of Film Evangelism to deliver the core Kerygma/Gospel of the life, teachings, miracles, suffering and death and glorious Resurrection and Ascension of our Lord Jesus Christ. Our Mission needs to upgrade the speaker of our Jesus film equipment to reach large crowds. A new speaker suitable for field use, rugged and waterproof, costs US$310. We also desperately need a new field vehicle with greater fuel efficiency and towing capacity, for overland missions. An effective and reliable 4wheeldrive vehicle with increased suspension, extra fuel tanks and snorkel for river crossings, winch and other essential adaptations would cost US$39,000. Frontline Fellowship is a Bible based African mission that has pioneered missionary work into neglected mission fields and areas resistant to the Gospel. 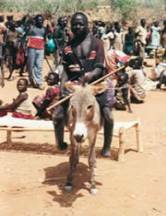 Since 1982, Frontline missionaries have traveled hundreds of thousands of kilometers by foot, by motorbikes, by dugout canoes, trucks and aircraft to boldly proclaim the Gospel of repentance and faith in Christ to soldiers, guerrillas, resistance fighters and civilians on all sides of many conflicts in Africa . * Pioneering missionary work into war-ravaged Angola , Mozambique and Sudan. * Researching and opening up neglected areas and restricted access areas. * Assisting persecuted Christians and prisoners with books, emergency relief aid (including tons of medicines, foods, clothes, seed, bicycles and tools), encouragement and Bible teaching. nurses and civil leaders in neglected areas. on radio, T.V. and in hundreds of international meetings every year. Frontline Fellowship is a leading force in leadership training and networking for Reformation. Frontline Fellowship publishes an average of 80 items a year and has distributed millions of Gospel leaflets, booklets, books and Bibles throughout Africa. Frontline Fellowship conducts an average of 20 seminars, conferences or workshops each year. Through literature and leadership training, Frontline Fellowship is educating and enlisting tens of thousands of Christians to “disciple the nations…teaching obedience.” Just in Sudan, since 1995, Frontline Fellowship trained thousands of pastors, chaplains, medics and teachers. In Zimbabwe , Frontline is distributing food, medicines and Scriptures into some of the most desperately needy areas and providing leadership training.thousands of pastors, chaplains, medics and teachers. 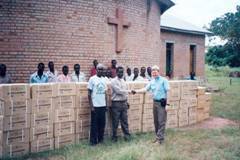 They also provided thousands of Christian textbooks to over 100 schools in Sudan . FF has delivered and distributed over 300,000 Bibles and Christian books in 21 languages throughout 14 regions of Sudan.